Phoebe Judge talks with Callie Wiser, director of Klansville U.S.A.
Why was the Klan so successful in NC? In North Carolina, the leadership of North Carolina was less willing to stand for maintenance of segregation. There were a lot of people in the South that who felt like segregation was the natural order of things, that was the way they'd grown up, that was the way order was maintained and they couldn't imagine a world outside of that. In Alabama, George Wallace was saying 'Segregation now, segregation forever.' In North Carolina there wasn't anybody who was speaking that populist voice, who was speaking to the people who felt like segregation was very important to the maintenance of their lifestyle. And so [many North Carolinians] were drawn to the Klan. 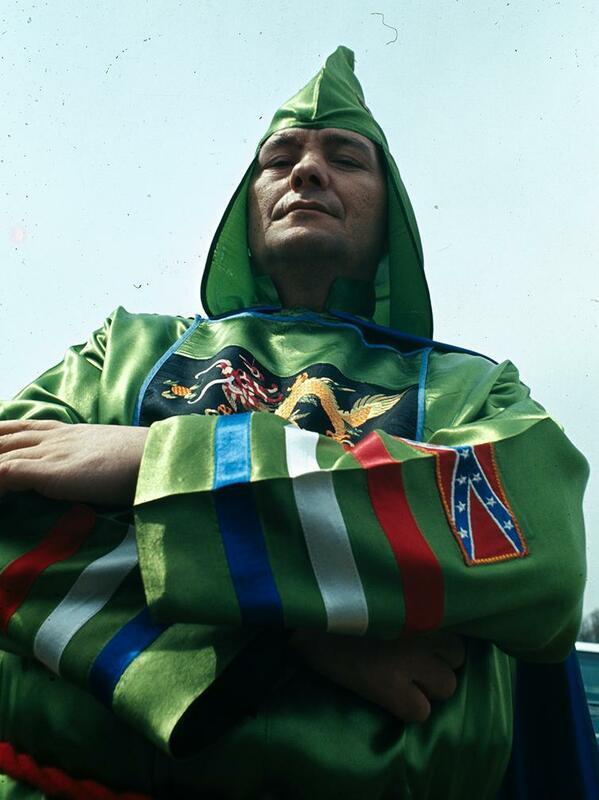 In North Carolina, the Klan was a little bit different. The North Carolina Klan did not have the spectacular violence the Klan had in the deep South. I think there were a lot of people who were able to join the Klan and ignore [the violent] part of it. A lot of people felt that they were joining this thing, they were a part of something. They were the treasurer of the group, they had never been allowed to be in the Rotary Club, but here they were the Treasurer of the Klan. They were with their buddies, they were being somebody. The violence to them wasn't important. Sure there were people who wanted to do violence, but the majority of people who joined in North Carolina weren't people who joined in order to have an excuse to do violence. [Klan members in North Carolina] were ... not part of the elite groups. People ... saw their world slipping away and they wanted to be a part of something. >> Look at these recently discovered images from a KKK Rally in Chapel Hill in 1987. How visible was the Klan's presence throughout the state? They had more than a handful of huge billboards across the state that would say 'Be a man, join the Klan.' They were very visible and they wanted to be seen as human beings. Anybody who lives in North Carolina in the 1960s and '70s, if you mention the Klan to them, they mention this billboard in Smithfield on the way from Raleigh to the beach. They talk about this huge billboard [posted by the Klan]. There was an anti-masking law in North Carolina, but Bob Jones [the leader of the Klan in the state] wanted people to know that he was a normal person, he wasn't crazy, he wasn't out there. He wanted people to see him, not see this group. These are people you do business with. What was the role of women in the Klan? And she said 'It's hard to ignore the other [violent] part of it, but at the time, it didn't feel like we were part of something nefarious. What brought about the end of the Klan in North Carolina? You know, I think in this case, the Klan's violence was in the end their undoing. Television had been invented, and television brought these horrific violent acts in Mississippi and Alabama into people's living rooms. [Some Klan members] went before the House Un-American Activities Committee. They were actually called un-American. And I think that was something that people saw as reserved for Communists, and all of a sudden to have the Klan there ... [It] made people realize that it may not just be a group that you could be a part of just to represent you. It was something ... you could be in trouble for. Clemon H. Terrell enlisted in the Coast Guard in 1950 as a steward. He would make the officers' beds and shine their shoes, among other duties. Due to segregation, there were limited opportunities for advancement. This week, 34 years following his retirement from the service, Terrell was promoted to honorary Coast Guard Chief Petty Officer. "I was ecstatic. Being promoted to Chief Petty Officer is a prestigious promotion," he said, adding that the the Chief Petty Officer has the respect of everyone "from the Admiral on down."